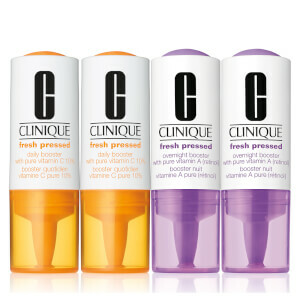 Clinique's Fresh Pressed Vitamin Retinol Duo is a powerhouse pairing that combines Vitamin C and Vitamin A for their synergistic benefits. For both day and night, the skincare boosters will leave skin feeling brighter and revived. Stay-fresh packaging protects the potency for maximum effectiveness and results. Suitable for all skin types. Allergy tested. Free from fragrance, parabens and phthalates. Non-acnegenic. A concentrated, anti-ageing solution that works to visibly even and brighten skin tone. The Fresh Pressed™ solution works as a daily supplement for fatigued, ageing skin. Effortlessly blending into a daily moisturiser, the Vitamin-rich emulsion enhances the hydrators effects, invigorates skin and transforms its texture. Fine lines, wrinkles and age spots are visibly reduced, instantly leaving the complexion bright and youthful. 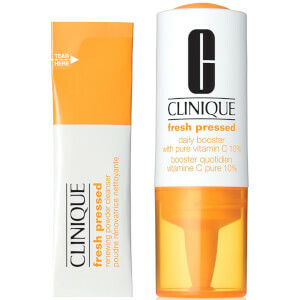 Housed in stay-fresh packaging, the Vitamin C formula is isolated until exposure to oxygen, which activates the booster and allows for maximum results. A liquid concentrate encapsulated in a double-walled chamber. Transforming your moisturiser into an anti-ageing powerhouse, the overnight treatment is freshly activated and contains Vitamin A (Retinol) to tackle signs of ageing. Penetrating effectively into skin, it will help to revitalise the complexion while plumping out the appearance of wrinkles and restoring youthful-looking tone. 2. 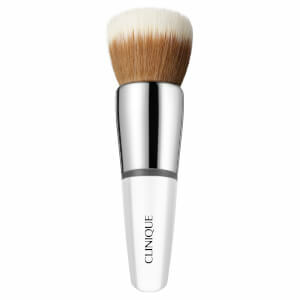 Firmly press inner bulb 2x to release Vitamin into the de-ageing soothing emulsion. 1. Shake before use. Remove cap. 3. Mix in hand with a dollop of your moisturiser. For Vitamin A, use at night only, smooth all over face, but avoid the eyes, neck and décolletage. Daily sunscreen is imperative.